Through a process of self-questioning and reflection, artist Dominic Thorpe considers some of the responsibilities of the artist when working with stories of other people’s traumatic experiences. I sometimes make artworks dealing with other people’s personal and traumatic experiences, including mental and physical ill-health, and various human rights abuses, often through direct engagement or collaboration with them. Doing this work feels important for many reasons, not least because art offers possibilities to open up necessary, wide-ranging and honest forms of interaction and discourse where existing forms can be narrow. I attempt here to articulate some of my thinking underpinning this element of my practice, and in so doing identify what I consider to be some of the responsibilities of the artist when working in this way. Questions I regularly ask myself include: What right do I have to make artworks dealing with other people’s difficult experiences, and why do I want to, given that I have not experienced such trauma myself? What and who is the work for? Is it needed? What will it achieve and are the outcomes quantifiable? What’s the point if little or any change is generated reducing the numbers of people who have these experiences? If I don’t make the work am I complicit in silence and therefore contributing to the problem? Taking chances and failing are important to discovery, so how can I work in ways that enable the freedom to create and discover while also being cognisant of possible significant consequences failure may have for other people? It is important to try to understand how artworks can function in the communicating of such stories, because the risk of objectifying people only to benefit from their difficult experiences is very real, as is the risk of not realising that’s what could happen. I don’t want to have somebody else’s story become only a source of entertainment. It is also important to acknowledge I have no ability and no desire to feel someone else’s actual pain or distress, and I don’t pretend to do so. Nor do I want to give an audience the impression that they will be made feel this way. What is it about engaging with another person’s story through an artwork that can offer a potentially more resonant experience than other means of encountering stories, such as being confronted regularly by tragic stories and images through the media? For me, experiencing a particularly affecting artwork can result in the internalising of another person’s story in such a deep and personal way that a connection is created with my own life experiences, thoughts, ambitions or emotions. In this way, artworks put us in the picture even as audience. They can force us to acknowledge our connectivity with each other’s lives making it difficult or impossible to sustain a position of detached observer. When we gain more awareness of our individual positions in relation to the lives of other people, there are two obvious choices – to keep or change those positions. This gives art an important role when trying to understand and deal with systems of care, human rights abuses and personal tragedies. I have a responsibility to collaborators, audiences and myself to be clear about my motives and ambitions for working in the way I do. The development of my own understanding is always central. I also try to become more personally connected with individuals and situations that cultural norms and social structures (such as the asylum services and our attitudes towards mental health) can keep us separated from. There may be many spoken and unspoken expectations and desired outcomes that all collaborators in an art project have. Trust is important and can be built through regular conversations and interactions where people develop a sense of what each other needs and feels. I have worked with people who wanted their friends to stop killing themselves. People who wanted to develop understanding about a particular subject. People who wanted their story to be told and heard. People who wanted to learn about more about art or just wanted something to do. People who wanted to access other sources of funding. People who wanted to stop feeling helpless. People who wanted to support others who may be going through a similar experience as themselves. People who didn’t know what else to do. Audience members also need to be considered as they may be affected by artworks for many reasons, including the actuality of their own lived experiences, and through empathy or compassion. I never aim to upset, but I realise this is a strong possibility given certain subject matter. Supporting an audience is important and clear publicity material, good and visible information wherever the work is shown and invigilators who understand the content can all help with this. Such mediation however should not be prescriptive to the point of diminishing the space for an audience to be surprised and to generate their own meaning from encountering the work. Underlying all of this is a responsibility, inherent in art practice, to strive for artistic integrity and quality. Poor artistic merit must not be allowed to become a reason for people to ignore important subject matter. The artist, and their collaborators, also have to live with what they do. Of course many other questions could be asked and reflected upon seriously, including questions about representation, levels of collaboration, authorship and ownership. It has been my experience that informed and thoughtful enquiry in to how and why I work in the ways I do is crucial for supporting the development and integrity of whatever happens in my practice. On a final note, making work in this way can be personally very taxing and emotionally draining. Showing and talking about work to colleagues in the arts is important and always helpful. Sometimes art projects result in visible changes and that is immensely rewarding. It can, however, be difficult to reach the end of a project only to find that little if anything has visibly changed. But that doesn’t mean it was pointless. Small things do happen and small things need to constantly happen. They can surprise and transform, and at the very least they are what create the conditions for transformation. Dominic Thorpe is an Irish visual artist who works primarily through the body in performance, drawing, video and photography. His work often involves contextual and relational based processes. Through his practice he engages with subject matter that has significant social importance, often related to issues of trauma and injustice. 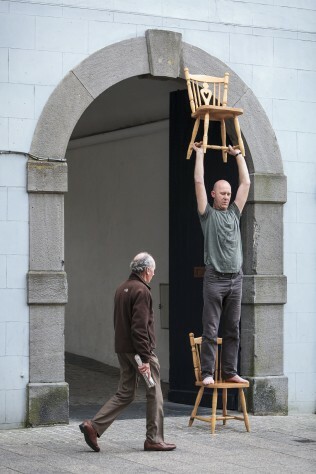 He has shown and performed work widely internationally and in Ireland, including at the Irish Museum of Modern Art, The Bergen Museum of Art Norway, the Bangkok Cultural Centre Thailand and the Galway Arts Centre Ireland. He has received numerous awards and bursaries from the Arts Council of Ireland, the Kildare County Council, Culture Ireland and Create, the national development agency for collaborative arts in Ireland. For Unit1 he has co-curated the work of over 70 Irish and International artists. In 2006 he received an MA in Fine Art Practice from the National College of Art and Design Dublin. He currently works at the Creative Well, Riverbank Arts Centre, Newbridge and at KCAT Arts Centre Kilkenny. Dominic is currently the first artist in residence at the humanities department of University College Dublin. Dominic a very thought provoking article. There are some artists working in the art and health field are often left to their own devices. A lot of Artist working in the Art and Health field are often young artists just out of College. Very insightful article and as a person who is an an artist with a lived experience of mental distress, I am interested in the representation of social and political dimensions of trauma and people lives. How does on represent the subject that validates an experience of another person, with dignity and human rights as a point of reference? I have a responsibility to collaborators, audiences and myself to be clear about my motives and ambitions for working in the way I do.